Coco Cake Land - Cakes Cupcakes Vancouver BC: The Hungry Caterpillar Cupcake Party Train! The Hungry Caterpillar Cupcake Party Train! I loved doing this so much! I get such joy when I receive a phone call or email from someone with a great request. The Hungry Caterpillar for a 1st birthday bash? You betcha!! Just for the fun of it I decided to document the "making of" the caterpillar, so here it is! 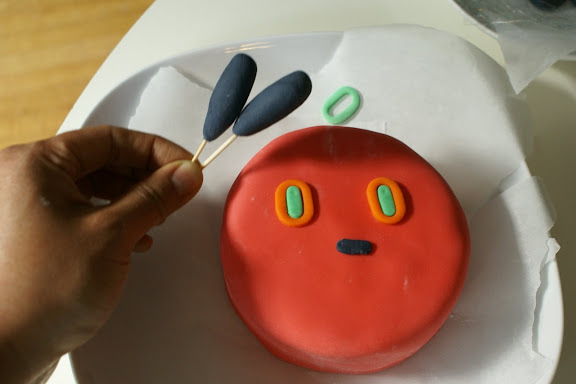 I first made a ridiculously cute and small round vanilla layer cake with vanilla buttercream, covered in red fondant to create the adorable face of my little caterpillar buddy. Fondant eyes and nose, and two antennae, plus little bootie feet for the caterpillar were also made! I did vanilla cupcakes, and vanilla buttercream in a "psychedelic swirl" effect, blending two shades of green to try and mimic Eric Carle's beautiful watercolors. Little chocolate sprinkles plunked one by one into the buttercream created the furry bits of the caterpillar. 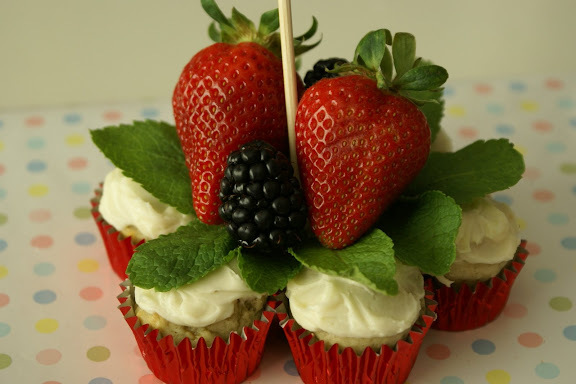 To finish, I made a baby friendly "berry patch"-- low sugar banana cupcakes with mint leaves and fresh berries. The key to the puzzle was securing each cupcake down with my good pal Royal Icing. This stuff hardens like glue, so the cupcakes would remain secure on their polka dot cake board while traveling. 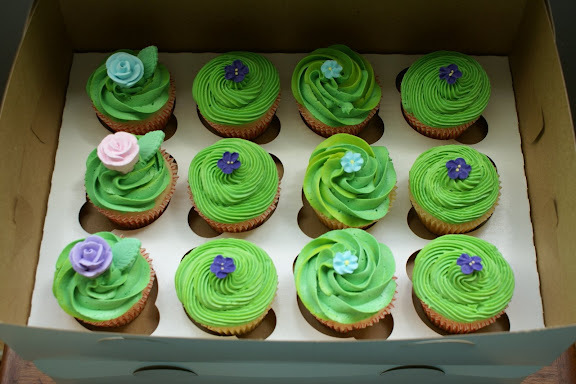 Additional grass green frosted cupcakes with pretty flowers, roses and leaves also accompanied Caterpillar on his journey to 1st Birthday Land. Eeks this made me so happy... and here's to a very Happy 1st Birthday to cute little Jamie! 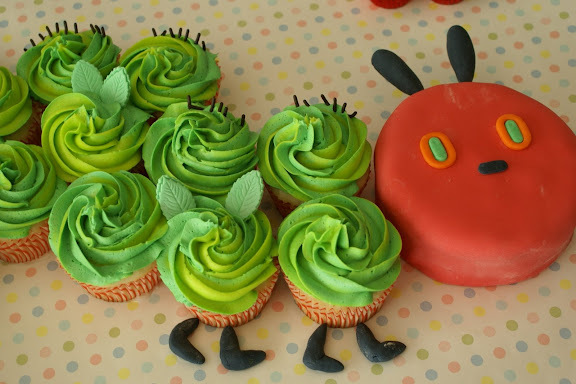 OOOOOOOOOOH I love your Hungry Caterpillar cake/cupcake train. 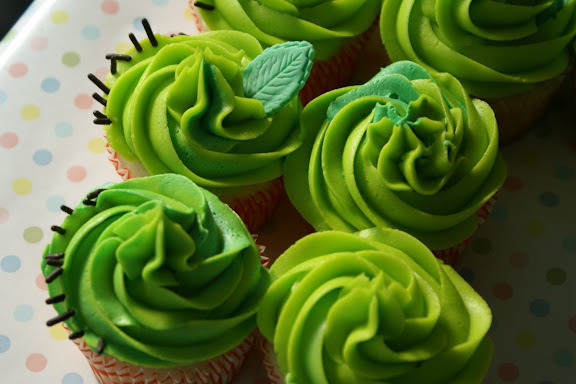 Love the swirly greens in the frosting too, just like the look of the book. That's one lucky little one-year-old who got it for his bday. :) Awesome work mb! This is STUNNING! I am continuously astounded by your beautiful creations! I actually gasped! I adored the hungry caterpillar book as a kid, and you recreated it beautifully! I love how vibrant the green is, and I really liked the added touch of chocolate sprinkles for the 'fur'. Amazing job, and very inspiring! -tara, what an awesome and amazing fluke! eric carle's birthday!? how cool! -gyoza girl, aka my sis, thanks!!! can't wait til BB turns 2! --thanks jennywenny, jessy and seed! i appreciate it! Fantastic job - such attention to detail! I'm going to link to this post in a couple of weeks when I write about Spring Desserts. This is the coolest kids cake I've ever seen! It's beautiful and whimsical and so much fun! 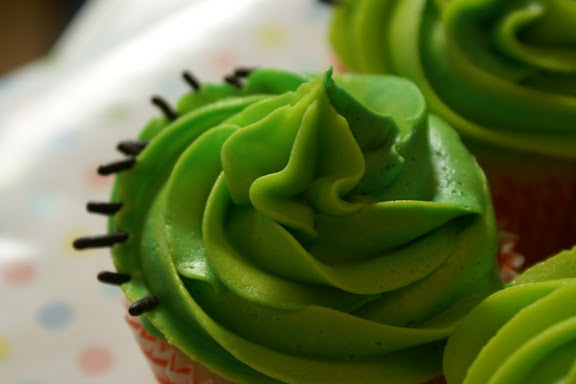 --emily, the frosting tip i used for the green swirlies is 1M, it's a star tip, you can find it online everywhere and at any cake decorating shop! or even craft megastores carry them. These are amazing! I'll have to link to this in my next Crafty Food Roundup. How creative! rosa, laura, rachel-- thank you! rachel, i'd love to be part of your craft round-up! great website you have! I'd love to reproduce this for my babies next birthday. 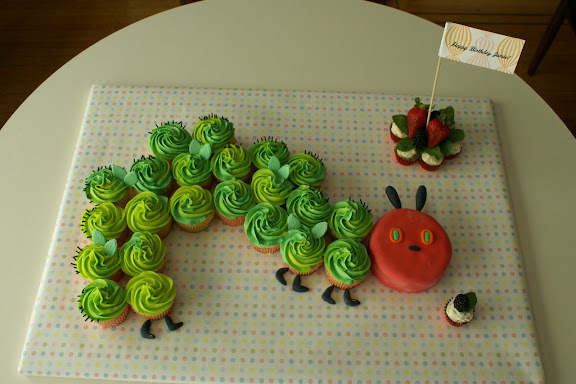 Love your blog and LOVE the caterpillar cake - I was obsessed with that book as a kid. This is an absolutely wonderful creation..Can I ask what greens you used...Wonderful!! for my greens, i actually just used classic leaf green (gel color) and lemon yellow, and blended until i got a bright sort of fluorescent green. that, blended with leaf green in the piping bag gave it a more "tie-dye melding colors" vibe. Hey Lindsay, Hope you don't mind, I stole your idea here to make some cupcakes for my kindergarteners. Thanks for the inspiration! --also send me pics of your caterpillar!! i love seeing what other people are up to! Incredible. I am going to make this for my sister's baby shower. I don't have much experience with cake decorating, but I think it will be fun! Thank you so much for sharing. Open Loop, don't you worry--- it will turn out awesome!! Email me if you have any questions. I saw this linked from the Crafty Crow and although my son is only 5 months old, it has already inspired the planning for his first birthday-- including this adorable cupcake creation!!! I hope it is ok I have linked to your blog from mine. I LOVE your cake! I plan to try it out for my dd2's birthday, so will let you know how I get on. So, so, so beautiful. I think I'll be making it for my niece's birthday. I just love it, and even I could make it. I am planning on using your beautiful cupcake creation for inspiration for my daughter's first birthday! It truly is a masterpiece! 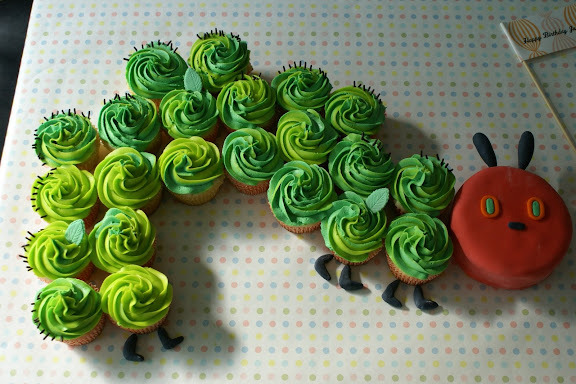 Please let me know what size round cake you used for the caterpillar's head and what tip you used for the cupcake frosting. Thanks!! nina, it's a 7 inch round cake that I used for the head, and a star tip for the frosting. I absolutely love what you did for the party theme! I'm so excited to do this for my son's 1st Birthday in February. I appreciate your tips as well with all the supplies you used in the comments. So very helpful..thanks! I love these cupcakes! I'm attempting them for my daughter's 2nd birthday this weekend. Do you make those flags? Are they just craft paper and toothpicks/skewers? They are adorable! 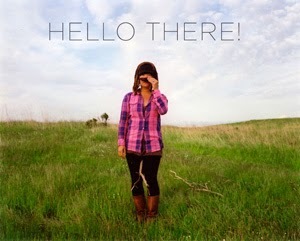 I found a picture of this on some random website and loved it! I found my way here and then decided that I was going to make my own caterpillar cake for my youngest nephew's first birthday. Thanks for the inspiration! Could this be any cuter? I don't think so! Thank you thank you! Although mine did not look nearly as perfect and adorable as yours, I tried to recreate it for my son's 5th birthday. Danelle-- thanks for stopping by! Hope it turned out awesome! Hi Laura -- thank you for your comment, I am sure it turned out beautifully! Wow! I don't know you but seeing such beautiful creations makes me want to know the person behind it. Amazing job! This is such a great cake. One of my clients saw your pictures and asked if I could recreate something like it for her daughter's first birthday, and everyone absolutely loved it. Thanks for the wonderful idea and the suggestion about blending the buttercream colors for the swirl effect! 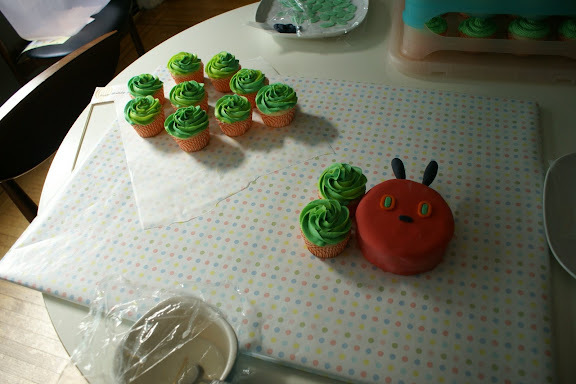 I did a search of a hungry caterpillar cake for my son's 1st birthday party, to get some inspiration! I like this idea very much. As you are not in Sweden, I will have to try and do this myself! If you have any tips and ideas to make things easy! please email! I wanted to try to do this theme for my daughter's 1st birthday party coming up in July - and came to find your site! Thanks for such a gorgeous inspiration; I will report back on how it turns out :) By the way, any tips on getting the 2 color frosting on the cupcakes?? I've seen these so many times before and always wondered where they came from - these are amazing! ^^ I love how cute all of your cakes are. 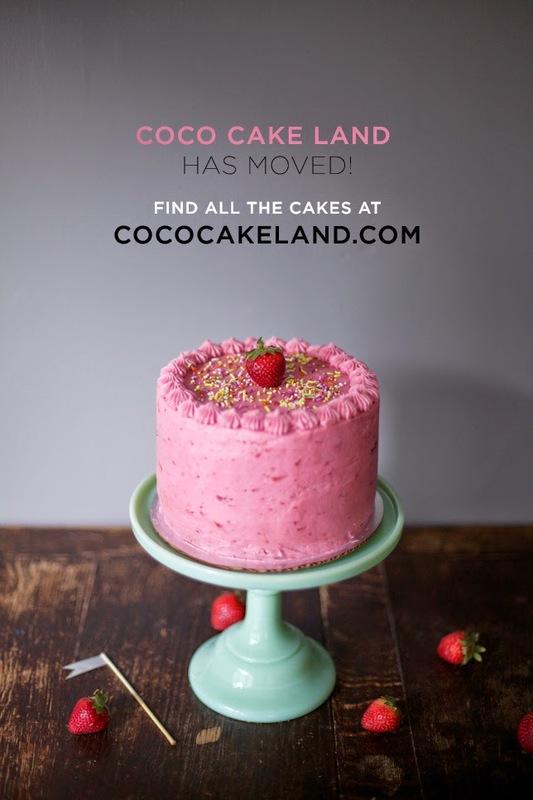 Another comment almost seems redundant here, but I just had to say this cakes is WONDERFUL!! So beautiful, as are all your cakes. It's very inspiring. I'm in the land of Oz so cannot place an order for one of your cakes (maybe you should consider moving here! hahaha) so I shall have to muddle along and have a go at replicating it myself. I love this catepillar cake! It's soooo cute! My son and I read that book all the time. I would love to make that cake for one of his birthdays. Very cute! It's great because you can easily alter the size of the caterpillar to accommodate the number of guest you have. Funtique Parties can also be a lot of help if you're planning a birthday party. Thank you so much for putting this online! I made this cake for my little boy's 1st birthday the weekend before last and we all loved it! Thank you so much for posting these photos - I made this for my little boy's 1st birthday the weekend before last and we all loved it! I love this cake! We made it for my son's first birthday (minus the fondant) and it came out so cute! Of course it wasn't as awesome as yours, but I really appreciated this great inspiration for his cake. I have a child with nut allergies, so I have to make all of my children's cakes. It was nice to have a fairly simple one this time. I'm blogging about it and will definitely link to your site as my "inspiration." 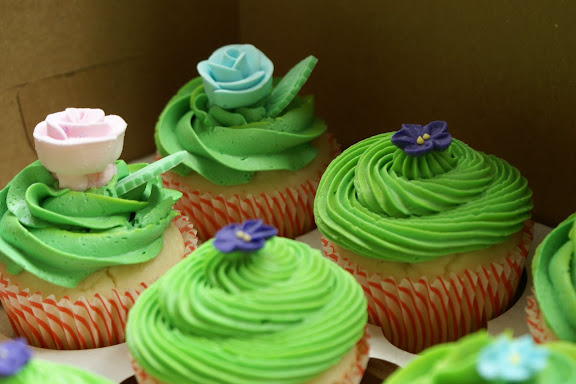 Very beautiful cupcakes, love it ! Thanks so much for posting this along with all the tips. We made this for our sons first & had a great deal of fun too in the process!